We’ve got some very exciting news related to the Ayreon Universe live shows at the 013 venue in The Netherlands. This Saturday 3 June, at 10:00 AM CEST, ticket sales start for two newly added, exclusive, and very limited Ayreon Universe events. Read on for all the details! The official try-out for the Ayreon Universe show will be on the Jupiler stage at the 013 venue in Tilburg, The Netherlands. 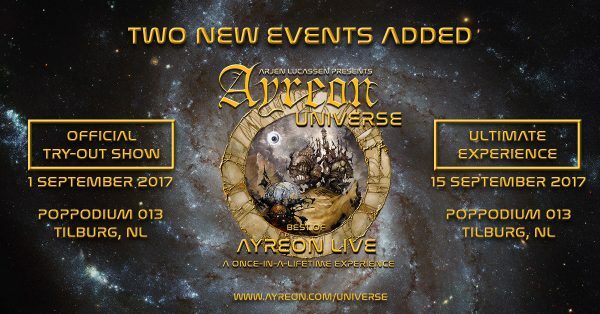 Be the first to experience the whole set of the Ayreon Universe live shows! Featuring the the full Ayreon Universe live band with Ed Warby (drums); Johan van Stratum (bass); Marcel Coenen (lead guitar); Ferry Duijsens (guitar); Joost van den Broek (keyboards); Ben Mathot (violin); Jeroen Goossens (flutes, woodwinds) and Maaike Peterse (cello). Please note that the Ultimate Experience tickets give you access to the dress rehearsal only. To make it abundantly clear, the Ultimate Experience ticket does NOT grant entrance to any of the full evening shows. Entrance to any of the three full evening shows requires a separate and valid ticket. NB! In case you read too fast and missed it: The Ultimate Experience is limited to 100 tickets. We expect tickets for both of these events to sell out very quickly, so if you want to come and join us in September, make sure that you are ready to buy your tickets this Saturday 3 June at 10:00 AM CEST! Take care and see you at 013!